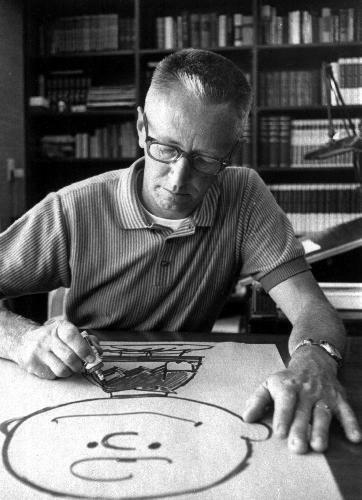 Do you have any advice on how to successfully buy original artwork by Charles M. Schulz? In this 21st century Internet age, caveat emptor -- "let the buyer beware" -- is more than a suggestion. It should be a way of life. Not a week goes by that we don't learn about yet another case of somebody attempting to sell questionable or outright fake Charles M. Schulz artwork via the Web. Most of these cases take place at eBay, CraigsList or other Internet marketplace sites, but a few eyebrow-lifting cases also emanate from what appear to be legitimate galleries or dealers of animation artwork. Begin with this statement as a mantra, and tattoo it to your eyelids: Very little (supposed) Schulz artwork can be authenticated, except for original Peanuts strips. Additionally, the realm of Peanuts artwork can be tricky. Plenty of drawings of Charlie Brown, Snoopy and the rest of the gang were -- and continue to be -- done by contract artists for book illustrations or advertising campaigns. (Think MetLife.) In many cases, these artists worked hard to imitate Schulz's line work. Professional artist Tom Everhart, known these days for his wonderfully large and opulently colorful paintings of Peanuts characters, began his professional relationship with Charlie Brown and the gang by imitating Schulz's line work for (among other things) national magazine covers of the Peanuts characters. Tom has, on numerous occasions, shown examples of these drawings during PowerPoint lectures. Many of these drawings even bear Schulz's signature, because they were intended to be indistinguishable from the real thing. But they're not Schulz's work. As the years have passed since Schulz died in early 2000, the attempts to profit from fraudulent reproductions of his artwork -- or claims that he was responsible for legitimate Peanuts drawings done by other hands -- have multiplied exponentially. The reason is obvious: The one person who could examine any piece of work and state definitively that he did or didn't draw it -- Schulz himself -- no longer is with us. As a result, such analysis has fallen to those of us who've schooled ourselves in Schulz's work ... and we're saddened and frustrated by much of what we see. *** One individual, having contacted the Charles M. Schulz Museum to have a piece of dodgy artwork evaluated, was told quite emphatically that the work was not authentic. Despite this, the individual in question offered this piece for sale via eBay the very next day, claiming that it was, indeed, actual Schulz artwork (and conveniently failing to mention the correspondence with the Schulz Museum). *** We have been surprised, on more than one occasion, to find a seemingly unique piece -- say, a sketch of Snoopy, drawn by Schulz under very specific circumstances -- offered for sale by more than one individual. Obviously, only one of them could be authentic ... but chances are, they're all bogus: copies made from a single original. Now, plainly, this is so obviously not a Schulz original, that we can't imagine anybody believing otherwise. 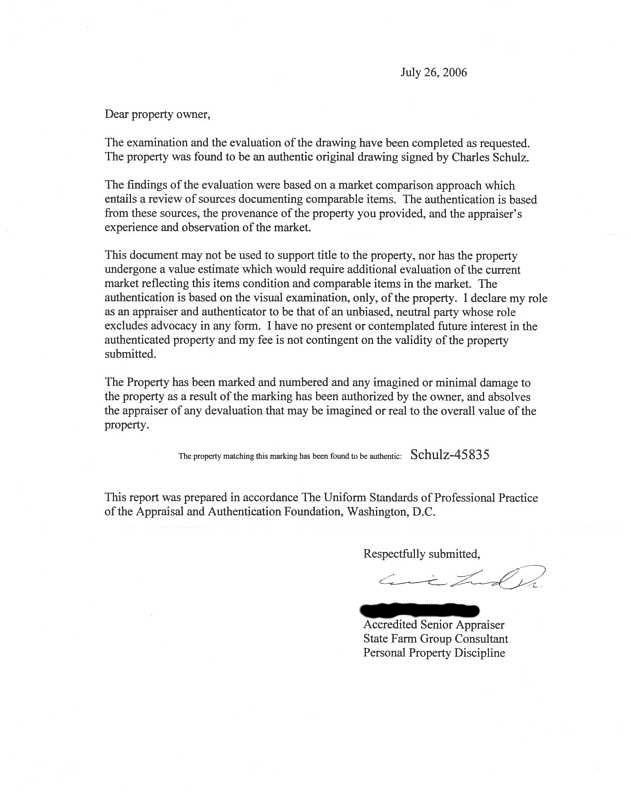 And the "letter of authenticity" is a joke: clearly made up by the seller, who is trying to sound legitimate with a mix of official-sounding buzzwords and efforts at jargon. If it weren't such blatantly criminal behavior, it would be pathetic. We wince at the thought of somebody being taken in by such a glaring fake. Our bottom-line advice is quite simple: No novice should purchase artwork via the Web ... ever. Artwork isn't like books, CDs or even electronic equipment. Every artist's work is unique, and that's the whole point; artwork lacks the mass-produced "safety factor" of hundreds of other items that can be purchased with minimal worries on the Internet. Artwork always should be examined, and in person, prior to purchase. It's not just a function of the art itself; a prospective buyer should be able to scrutinize the material on which the piece was created -- in other words, the paper or sketchboard stock -- and the intricacies of Schulz's pencil and pen lines. (In person, an original pen line can be distinguished from a photocopy of that same line.) None of this can be discerned via long-distance, and certainly not by trying to study a tiny, low-resolution image of a badly photographed sketch or newspaper comic strip. Trying to make such a purchase long-distance, with such limited images for "reference," simply isn't smart. Yes, Peanuts Worldwide -- holder of the copyright for all Peanuts artwork -- and the folks at the Charles M. Schulz Museum do their best, when confronted with egregious cases, to shut down sales of obviously fraudulent artwork. But dedicated offenders are like gophers: Seal off one outlet, and they simply pop up someplace else. They can't all be stopped. Goodness, not even most of them can be stopped. The Internet makes fraud easy; a single crook can pretend to be dozens of different people by posting eBay auctions of spurious artwork under various names, and from various computers. There's no way to track them back to their source. And that's another important point. If you purchase artwork in person, while visiting a gallery, you establish contact with the gallery owner or manager; you have recourse -- and a place to return to -- should you have cause, later, to doubt or question the authenticity of the piece you just purchased. How would you do this during an Internet sale? Chances are, the "seller" is long gone, if indeed said individual was operating under his/her own name in the first place. And if you somehow can track down the individual s/he likely is halfway across the country, if not on the other side of the globe. Remember, as well, that reputable dealers should be willing to re-purchase, at the original price, any item that later is discovered to be not as advertised (in other words, not authentic). And a reputable dealer will do so cheerfully. Reputable dealers stand by their sales. Galleries and art dealers, even when visited in person, aren't "safe" unless they offer such return guarantees. There's no accountability on the Internet, particularly when dealing with individuals. You can't confront them; you can't demand your money back. And although (for example) eBay and PayPal try for accountability, such "protections" may not be worth much if the perpetrator has fabricated all "personal information" and is running a fly-by-night operation that disappears as soon as the sale is complete. It's also necessary -- and we can't stress this enough -- that you know the territory, at least to a degree. Do some homework. If a "limited edition" lithograph bears a number, does that number fall within original parameters? 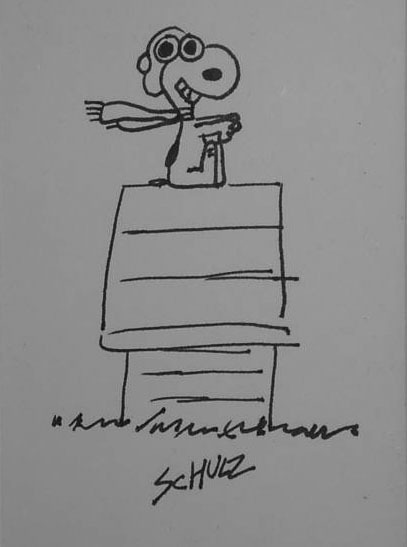 The folks at the Charles M. Schulz Museum generally can help establish that a particular lithograph was issued in (for example) a series of 100. If somebody is offering one that is numbered, say, 352 ... head for the hills. The item is bogus. It's sad ... and frustrating. All you want to do is own some nice artwork, and now you have to educate yourself? Well ... yes. The better to be informed, and therefore not taken advantage of. Okay, so what about established dealers and galleries that do business via the Internet? Surely they're honest and legitimate, right? That still doesn't fully protect you. Many dealers and galleries will claim that their own "experts" have evaluated and authenticated Schulz artwork. But what, precisely, does that mean? *** In a disturbingly high percentage of cases, it means only that the dealer has accepted the word of the artwork's original owner, with respect to the artwork's legitimacy. The dealer assumes the seller is being truthful. Is that a safe assumption? Let's believe the best of all concerned: The dealer could be operating in good faith; the original owner could be operating in good faith ... and the piece still could be a fake or forgery. How? Because the original owner could have obtained the piece under questionable circumstances ... or the piece could have passed through several hands, leading the most recent owners to believe, over time, that it started out as genuine ... when in fact it is nothing of the kind. Provenance -- the official history of authenticated artwork, which includes its origin -- becomes harder to track, let alone prove, as the number of previous owners increases. *** In other cases, dealers have staff members who study and "authenticate" the artwork themselves, regardless of what the original owner may or may not have claimed. But how, precisely, do such "experts" obtain their expertise? You can count, on the fingers of one hand, the number of individuals who are authorized to authenticate Schulz artwork. Obviously, these few people can't be -- and aren't -- working for every dealer in the country who claims to sell "authentic" Schulz artwork. In a worst-case scenario, the person at the end of the chain always gets stuck, if it turns out that a piece of artwork is bogus. There's another way to consider this issue, as well. What is motivating your purchase? Do you genuinely like the piece, and want to own it and display it? Or are you buying "for the investment"? Artwork should be enjoyed. If you're buying with the sole hope of making money via a future re-sale, you're an easier mark for scammers. Okay, what about animation cels, from various Peanuts TV specials? In theory, literally thousands of those can be floating around; surely they're authentic? Again, not always. And if you're not an expert, you could make a serious blunder. Actual animation cels, like original sketches, will have their own identifiable "raw ingredients." For openers, they should have registration markings. (If you don't know what those are, you need to learn.) Professionally produced and mounted reproduction cels -- those made for the collectors market, and not to be confused with original animation cels -- also are numbered and come with certificates of authenticity. Such certificates will be signed by very specific people. You need to know who. Furthermore, the term "cel" is used rather loosely these days; pencil roughs and preliminary sketches for cels aren't the same as actual cels ... although shady sellers won't make that distinction. If you contact a seller and ask for details, be wary of vague answers like this: "These pieces were bought from a gallery in [insert random city name]. They are all trimmed down and applied to a sheet of animation paper. The certificate of authority is hand-signed. I was told they came from an animator who worked on the film." 1) A reputable dealer would identify a specific gallery from whence the items came, and likely also identify a specific individual in said gallery. It wouldn't be some anonymous gallery in some big city. 2) "Trimmed down?" Not likely. And, if so, the value of the original piece(s) has been severely diminished, if not destroyed altogether. 4) The seller was "told" (by whom?) that the cels came from "an animator" (why no specific name?) who worked on "the film." (Which film, precisely? This would be known, if the piece were authentic). The case above is an actual example of an eBay listing. In the judgment of those who can authenticate such things, the supposed "animation cels" were preliminary production sketches ... not cels. Production sketches, done by countless anonymous hands, are so common as to be essentially worthless. Furthermore, when pressed, the seller finally cited a specific Peanuts animated special as the source of his items ... and yet a viewing of said episode proved that it contained no such scenes. The folks at the Charles M. Schulz Museum have reference copies of every Peanuts animated special, TV episode and big-screen film made ... and they're working on assembling a library of TV commercials. We at fivecentsplease.org don't claim to be that thorough, but our working knowledge of Schulz's work is sufficient to prompt sad head-shakes when we recognize fraudulent Internet sales. If you lack such resources, how can you expect to know, one way or another, whether somebody is telling you the truth? At the very least, if you insist on dabbling in the dangerous world of Internet art sales, you must educate yourself. Thoroughly. Okay, we've briefly discussed original artwork and sketches, and animation cels. By now, if you're still determined to purchase Schulz artwork via the Web, you must have decided upon the perfect solution: Run the details of the sale past us. If you're wondering why we've not been more specific here about certain details -- such as (for example) the size, thickness and rag content of the paper stock Schulz used for his original strips, or the brand of pen he preferred, and the resulting line it produced on said paper stock -- the reason is simple. We're not about to broadcast such information. It would simply help crooks make better fakes. The folks at the Charles M. Schulz Museum (for example) are in a position, thanks to such knowledge about a surprising variety of artistic, design and production elements, to determine quite rapidly (in ideal cases) if a given Schulz item is genuine ... or bogus. They intend to keep such knowledge to themselves. All of which brings us back to our original blunt statement: You shouldn't even try to purchase original Schulz artwork via the Web, unless you have an ongoing relationship -- based on earlier personal contact -- with a long-established dealer or gallery boasting an impeccable reputation. Peanuts Worldwide, the Schulz Museum and members of the Schulz family take this issue very seriously. They're concerned about the "image" of Charles Schulz's work being diminished by those who traffic in fakes or forgeries, either maliciously or in all innocence. The Schulz Museum does offer a list of reputable appraisers here. This is an invaluable resource: Use it, before contemplating -- or making -- any purchases. We don't mean to sound harsh or condescending, with respect to those of you who are well-meaning, would-be buyers. We're simply very concerned -- indeed, very worried -- on your behalf. We've heard too many sad stories. We don't want you to become another unhappy statistic. Unfortunately, numerous crooks in the world are trading on Schulz's legacy. Our intentions are simple: We want to help protect you from them. So please: Let's be careful out there.